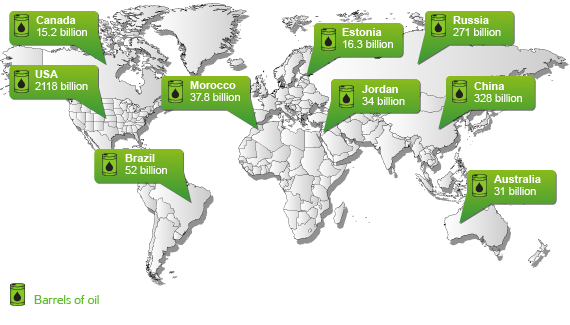 The largest oil shale resources are in the USA, Brazil, Jordan, Russia and Morocco. The most well known and explored deposits include the Green River deposits in the western United States, the Tertiary deposits in Australia, deposits in Sweden and Estonia, the El-Lajjun deposit in Jordan, and deposits in France, Germany, Brazil, China, and Russia. Oil shale is becoming an important resource globally because of its value as an alternative to other fossil fuels like crude oil and coal. As the resources of crude oil and coal become depleted, while demand for energy sources continues to increase, more and more attention is being focused on oil shale. Besides Estonia, which has been using its oil shale resources for oil and power production for almost 100 years, Brazil and China already use oil shale as an energy source, while in the USA – which is estimated to hold approximately 72% of the world's oil shale reserves – significant research and development with regards to oil shale is on-going, with numerous projects expected to be implemented within the next decade or so. In Germany, oil shale is used for power generation and for cement production. Oil shale is found in many places around the world with more than 600 known deposits in more than 30 countries on all continents. A 2005 estimate put the total world resources of oil shale at 411 gigatonnes.